On this first day of our gratitude journey, we are grateful for community; community as expressed in the truest sense of the word – “a feeling of fellowship with others, as a result of sharing common attitudes, interests, and goals.” Following the fractal nature of geometry, from the most intimate expression in our immediate family, to our chosen family, to our friends, our local community of neighbors, the community of our nations, and most significantly to our global community of fellow human beings—we are thankful for each one. We are all sharing and co-creating our individual experiences with precious life on this beautiful planet we call home while we are celebrating our common interests, which are far more numerous than the petty ideals that separate us. We celebrate you—our global ARK community—and invite you to join us in expressing our gratitude for community. To honor our community, we are shipping all U.S. orders for free, just enter the code COMMUNITY at checkout. For our international community, we will refund up to $200 of customs fees and shipping. Refunds will be granted after the initial purchase is made. Water is life. There is nothing more fundamental to be grateful for than this. For those of us who are lucky enough to live in a first-world country, water is something we barely regard–after all its nearly universal, we just turn on the tap and have clean, fresh, potable water anytime day or night. For over a billion people on this planet, this is not an option. Access to water—let alone clean water—is limited, and can be the prime focus of their daily existence. At ARK®, we are focused on improving the quality of water with the help of making water coherent, which allows this precious life-giving resource to be used more effectively. Join us in this celebration of gratitude for our life giver; water. Make a purchase today and receive a free copy of Torus Tech’s coherent water analysis report. 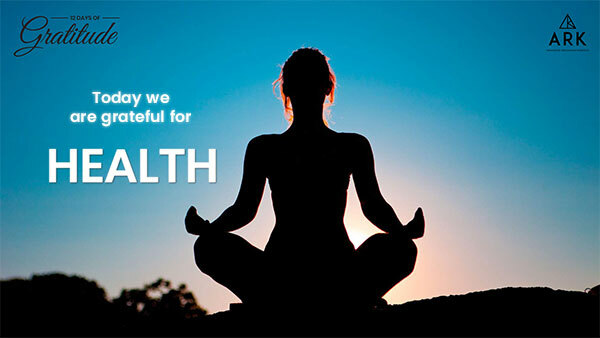 Health is something many people can take for granted. When the four elements of health are aligned, this is when a person can truly thrive. With a healthy body comes a strong mind; but, it takes work to get there. One of the ways to keep yourself healthy in body, spirit, mind and heart is to incorporate the ARK® crystal in your basic practices and routines. By including the kinetic energy of the ARK® into a meditation, reiki or yoga practice, users can channel that additional energy into their bodies and minds. Join us as we celebrate and practice gratitude for the health benefits we often overlook, and the kinetic energy brought by the ARK® crystal. To show our gratitude for a healthy mind, body and spirit, we’re including a free Luminas patch in every one of today’s orders; each patch is valued at $100. When applied, a Luminas patch radiates fast acting, long lasting pain relief without any drugs, chemicals, or known side effects. mind, and with a strong mind, you can heal your spirit and your heart. When all fields of the body and spirit are aligned, only then can a person find true health. What if you were connected to everyone in the world? How would your life change? There are patterns in every living thing that connect us all, and bind us as one thriving universe. Just as a butterfly’s wings can change the course of history, learning about our connection to the universe can dramatically enhance our worldview. 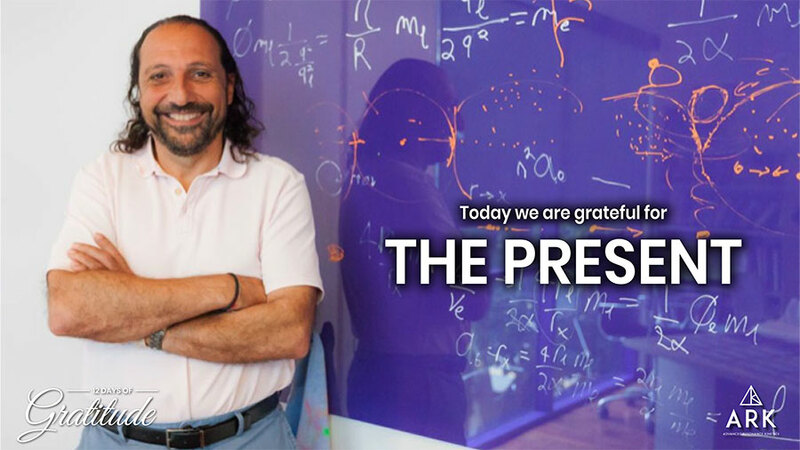 The founder of ARK®, Nassim Haramein, has devoted his life to studying the connection between every person and every living thing within the universe; and you can learn from his teachings too. The acclaimed documentary The Connected Universe, takes a deep dive into the beauty of our connection to nature, to the stars and to each other. Today, we are profoundly grateful for our connection to the universe, to everyone and to you. To commemorate our connection to you, any purchases made today, no matter how big or how small, includes a complimentary DVD of The Connected Universe. The definition of freedom is, “the power or right to act, speak, or think as one wants without hindrance or restraint.” What does it really mean? Many of us are free in a traditional sense, but what about mental and spiritual freedom? Are you free to open yourself up to new ideas? Free think at a higher level? Free to really feel the universe’s kinetic energy? We believe freedom is more than a right, it’s a fundamental way to live. We believe in unleashing your inner warrior and your inner god to truly experiencing what life has to offer. Because of this, for today only we are offering a free Armless Pendant with any purchase of an ARK® Crystal. The new armless pendant is a lighter and more refined version of the original. As the name states, the signature arms are gone, allowing your ARK to shine without restraints. Pick up one today and feel the freedom. When you think of the word abundance, what is the first thing that pops into your mind? Is it plates piled high with delicious food, the ability to live comfortably, or a room full of loving people? No matter what the definition of image of abundance is, we are grateful for all we have. For some, what we have may not look like much, but for us, our bounties lie not in material riches, but a strong and happy mind. At ARK®, we are abundant in our spirit and our mind; and we want to share that with you. On day seven of our 12 Days of Gratitude, we are thankful for the riches that come with energy, connectivity and a sense of community. Just as Sivananda said, “giving is the secret of abundance.” If you purchase an ARK® today we’re giving you an extra ARK®. Buy one, get one, our abundance is your abundance. 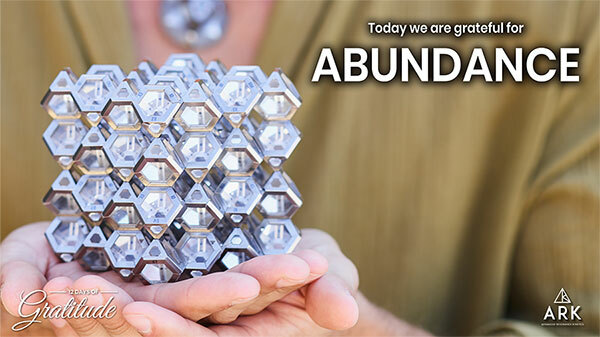 Just use the code: ABUNDANCE at checkout to get your second ARK® crystal. Where would we be without the past? Honestly, we wouldn’t have a future. If it weren’t for the scientists, skeptics and teachers who came before us, we wouldn’t have the foundation of knowledge we’re expanding upon today. Last year, we were lucky enough to travel to Egypt to learn about the secrets of the pyramids as well as the structure of the vacuum and the structure of space-time using long forgotten methods and technologies. Without the past we would have no framework for the future. It is with upmost respect we look to past technologies for future advancements. For the last three days of our 12 Days of Gratitude, we're honoring our past, present and future with a $256 off any order over $1,000. Enter the code Gratitude256 at checkout. What does it mean to be truly present? It means being grounded in the moment and not letting life pass you by, it means stopping to smell the roses and appreciate every second. It also means being grateful for everything that surrounds you. The beauty of nature, the love of friends and family, our connection to the universe. It is with this thought that we are grateful for the present. We are thankful for the here and now. Though some days may be tougher than others, we are thankful for the present moment. We are thankful for the ability to be present in this moment. For the last three days of our 12 Days of Gratitude, we're honoring our past, present and future with a $256 off any order over $1,000. Enter the code Gratitude256 at checkout. As we end our 12 Days of Gratitude and count down the days until 2019, we’re grateful for the future. There’s no way to be certain of what is coming next, but we are grateful for it. We’re grateful for the lessons yet to come, the people we have yet to meet and the experiences waiting for us in 2019. Yes, we are incredibly thankful for the past year, for what we have learned and what we have endured to get us to this point, but it is with open hearts we look to the future. We don’t know what that future could hold, but we do know it will be different, exciting, maybe even a little scary; no matter what, we’re here and we’re ready. We’re ready to go into the future with you, our ARK® community. For the last three days of our 12 Days of Gratitude, we're honoring our past, present and future with a $256 off any order over $1,000. Enter the code Gratitude256 at checkout.